Silver Chameleon: Are You Ready for a JOLLY HOLIDAY? Even when a day goes by that I don't post, you can bet I am at work digitally replicating background art! I have some real treats coming up for you. 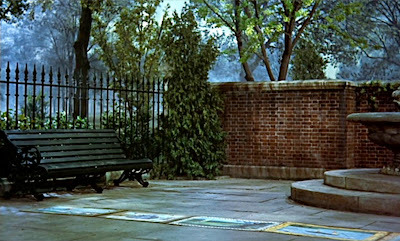 I had reason to take a look at MARY POPPINS again this week. What an amazing movie. Practically perfect in every way! I started in at the very beginning of the animated JOLLY HOLIDAY segment. Way at the beginning... in the park! Technically, these do qualify as animation backgrounds. 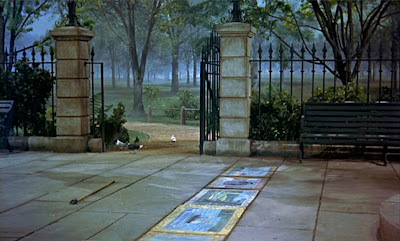 Remember the spectacularly colored dust when the POPPINS entourage jumps into the chalk drawings? Here are two views of the park sets. Magnificent aren't they? We've never seen these without the cast... until now. I digitally removed the actors so we could see the impeccable designs. Take special note of the painted backdrops. And if you think these are fun.... just wait 'til you see what's coming next. Let's just say it will be supercalifragilisticexpialidocious!